Decubital ulcers occur in large and small animals. These wounds occur when a bony part of the body -- human or animal -- rests for long periods against a hard surface, restricting blood flow to the area. "With blood flow restricted, tissue dies and sloughs, or detaches from the body,"
Follow any and all instructions from your veterinarian. 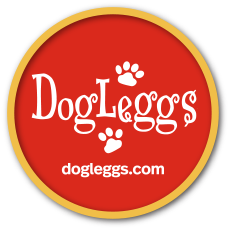 If DogLeggs are being used while wound is open and draining, place light cover-age using a telfa 4 x 4 and stretch gauze or vet wrap over the wound to hold pad in place and then put DogLeggs on. If the wrap method does not work, a “light days” feminine napkin can be placed inside the DogLeggs, the feminine napkin is self-adhesive and will stay in position, absorbs drainage and will not stick to wound. It may be necessary to create a donut from “pipe insulation” foam, a product readily available from home improvements stores, hi-tech or other foam with an opening larger than the outer margin of the decubital ulcer. The goal of the foam donut is to relieve all direct pressure on the ulcer.